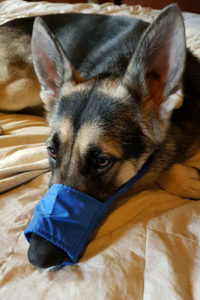 Would you know what to do if your dog…Choked on a piece of food? Ate something poisonous? Severely cut his paw? Collapsed and his heart stopped? Was hit by a car? Lost an eyeball in a dog fight? A comprehensive full day course designed to teach responsible dog owners and dog professionals the knowledge and skills to respond to a sick or injured dog until veterinary care is available, and to help you determine if veterinary care is required. The topics are covered in-depth so that students have a thorough understanding of the principles of canine first aid. Since this is a very comprehensive course, we need your full attention and dogs do not come to class. Our training tools include canine resuscitation manikins, plush demo dogs, bandages, first aid kits, even fake guts, eyeballs and more. 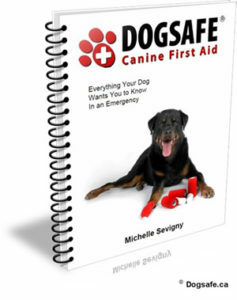 The class also includes the Dogsafe® 101 manual, “Dogsafe: Everything Your Dog Wants You to Know in an Emergency by Michelle Sevigny,” (118 pages, 56 real-life photographs, comprehensive and veterinary reviewed). Upon successful completion, you will be granted a frame-ready 8 1/2″ x 11″ certificate that you can be proud of! The Dogsafe® name is recognized and respected as the leader in canine first aid and safety training and you’ll be able to proudly display the Dogsafe® Certified logo to your clients, on your company website, brochures and business cards. Dog professionals will also be listed on the Dogsafe® ‘Find a Certified Dog Professional’ webpage, at Dogsafe.ca.